Add some pizazz to your to your room with the iconic Rocker lounge chair. Popular for decades in nurseries and other eclectic spaces, Rocker is an ambitious piece richly filled with symbolism.The original designers spared no effort searching for new materials and shapes. These ambitions led them to create the deep plastic seat pocket and waterfall seat edge chair, that you see before you. The simple reason for why Rocker became a phenomenon was as the result of its innovation take on minimalist design. But perhaps a deeper reason is the simple joy that this chair brings. 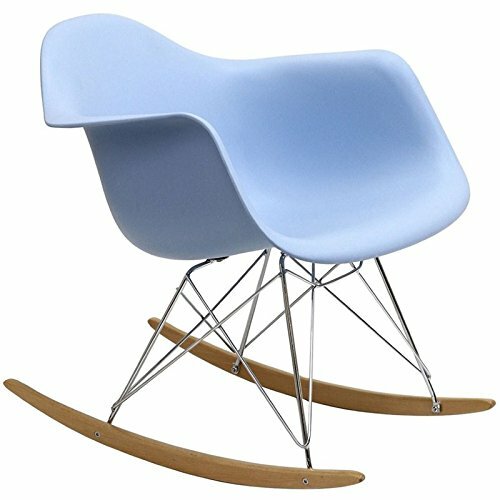 From the smooth-rocking sled base through to the organic elements, Rocker reminds us all of heart-felt aspirations. That while there is still much in this world that needs repairing, at the very least, our personal environs should reflect our hope for the world outside. That a room full of bright, creative elements, can help us to experience life as cheerful and upbeat people.Rocker's chrome plated steel base easily connects to the seat in minutes and comfortably sits adults as well as children. Although popular in nurseries, Rocker is often purchased as a cute, modern addition to any room.Perfect for softly lulling children to sleep or moving in tune to music, what else could a person ask for in a modern design? If you have any questions about this product by Hawthorne Collections, contact us by completing and submitting the form below. If you are looking for a specif part number, please include it with your message. Chair Glides Nickel Base 1" Nail-On, 100 pcs/bag .Protect All The Floors!